I have no photos of the Winter 2015 BACPS meeting |Sundews Etc. 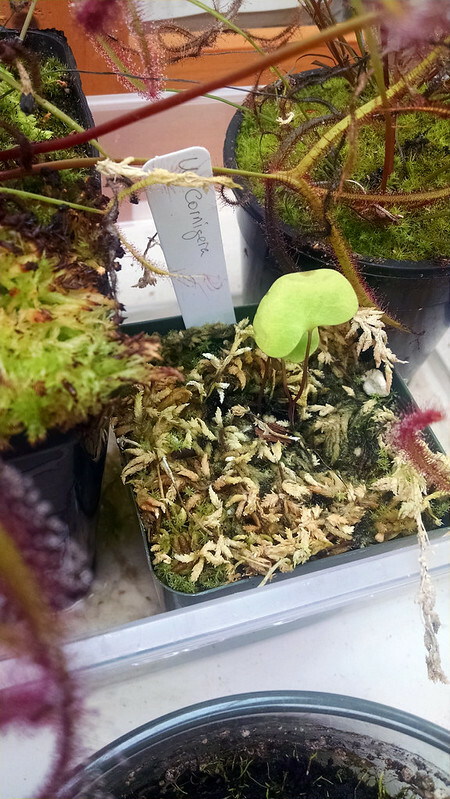 I feel sort of bad having entirely failed to document the Bay Area Carnivorous Plant Society meeting yesterday. However, not terribly bad, since the reason I couldn't take any pictures was that I was busy helping run the thing! I managed the raffle (and donated 5 plants, freeing some space under my lights), took part in a panel about cultivation, and somehow wound up being elected Vice President. It was a busy day! The BACPS has been in sort of a tight spot recently, since a number of board members either died or moved away, leaving the remaining leadership sort of scrambling to keep things together and getting worn out. It's funny, because in the mean time there has been a big increase in interest in carnivorous plants. I think there's a lot of energy out there waiting to be tapped in the Bay Area carnivorous plant community. I'm excited to be able to help out! I did, of course, acquire some plants. The first (and probably the most exciting?) is this Utricularia cornigera. This plant can get seriously huge. Gotta get a bigger pot! U. cornigera has also been known as the Giant or 'Big Sister' form of Utricularia reniformis. It's one of the coolest-looking Utrics out there, with big, upright leaves and totally stunning flowers. I hope I can get it to bloom. This is a seed-grown specimen from California Carnivores. 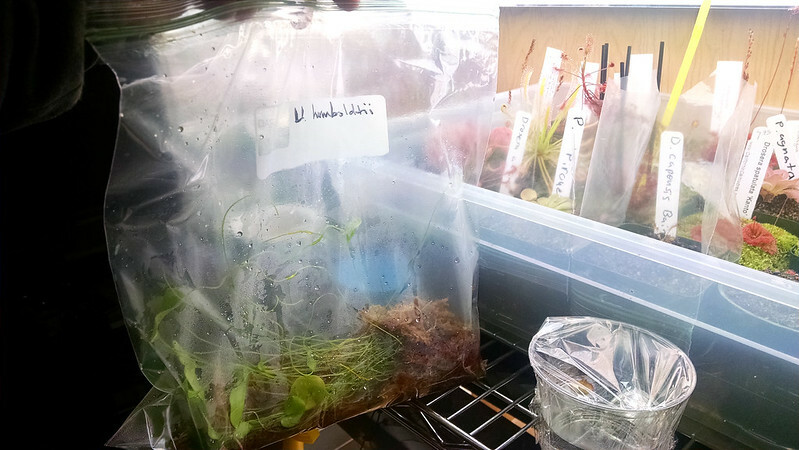 I was also generously gifted a big bag of Utricularia humboldtii by Tony Gridley, the BACPS newsletter editor and resident Genlisea farmer/Utricularia maniac. It's nice to get big piles of plants. I didn't get a chance to pot this up today. That's a chore for first thing tomorrow morning. Guess I'm jumping right into into section Orchidioides! 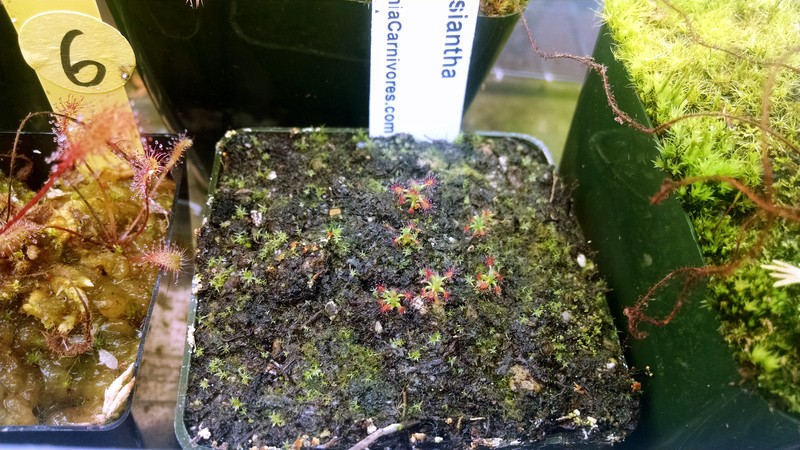 California Carnivores also had some pygmies for sale, and I picked up a pot of Drosera lasiantha. Gonna give it a week for more dew, and then the feeding begins. This is one of the few species I wasn't able to acquire from Drosera Gemmae this year, so it was great to see it for sale. It has a habit very similar to that of Drosera scorpioides, but with (apparently) cooler flowers. Very cute! I also was gifted a big clump of Sarracenia oreophila by Doris Quick, our now former secretary. It's got like 4 or 5 growth points. I wasn't able to get a picture for this post, since it's dark outside now. That rhizome (and the Sarracenia minor hybrid from the raffle) will have to wait for another post. I'm looking forward to some big old plants come spring though! 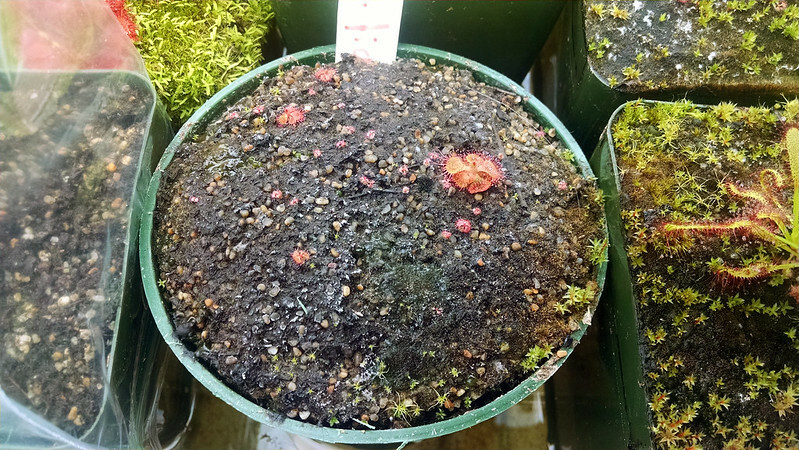 During the panel I was talking about the importance of feeding and light, specifically vis à vis so-called "annuals" like Drosera burmannii, and Fernando Rivadavia challenged me to grow Drosera sessilifolia as well as he sees them in habitat. Apparently all the specimens he's seen in cultivation have been tiny and frail-looking, while those in the wild get huge. Challenge accepted! We've got an early leader! It's a solid start. Gonna have to feed them more before the April meeting. Congratulations, Mr. VP! And awesome acquisitions! I plan to be at the April meeting! Can't wait to geek out about plants in person. Thanks Maria! I look forward to meeting you in April. There will also be a more casual social event in Berkeley on February 22nd. There will be more details sent out to the mailing list soon.